How do you feel when you receive a mass email from a company that clearly has no relevance to your needs? How do you react? The worst case scenario is that you unsubscribe from the email or report it as spam to your ISP; but more often than not, it just gets ignored and deleted. We are all too busy to read everything we receive so we focus on the things that are important and relevant to us. This is an important concept to remember when nurturing new home buyer prospects. The last thing you want to do is alienate prospects and turn them away because of your communication. The best way to handle this is to allocate time to database management and ensure that you have a good system in place for duplicate management, that you’re recording all prospect activity (and avoid sending duplicate messages), and that you segment your lists before sending out mass email to help customize the message to that group. It’s important to not hide behind email. Give your sales group opportunities to take a more personal approach to communication. For example, give them note cards (and stamps if necessary!) 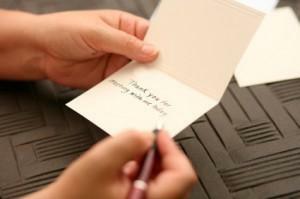 to write personal handwritten notes of thanks to their prospects. Encourage them to send birthday cards, or letters of congratulations when a milestone has been reached. Not only will this pay off in the long run from a referral perspective but it will create closer ties with the prospect. And don’t forget how you interact with your fans and those who engage with you in social media. What is the benefit of being a fan on your site? Do you have a process in place for acknowledging followers and re-tweets? Find ways to involve your fans, ask for their feedback and acknowledge their comments. A personal, professional approach goes a long way for long term success!